Survey said 70% of people* say they tell 7.5 lies a day. 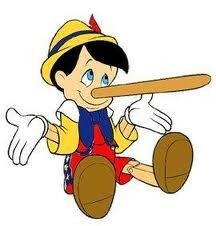 Lets break this down: 7 out of 10 people* say they tell 7.5 lies a day. That implies that 3 out of 10 people* said they don't lie. Therefore, 30% of people* tell 8.5 lies a day. * Instead of "people" UNCLE JOHN'S BATHROOM READER said "Italians". I think the same applies to all people so I neutralized the group identity.